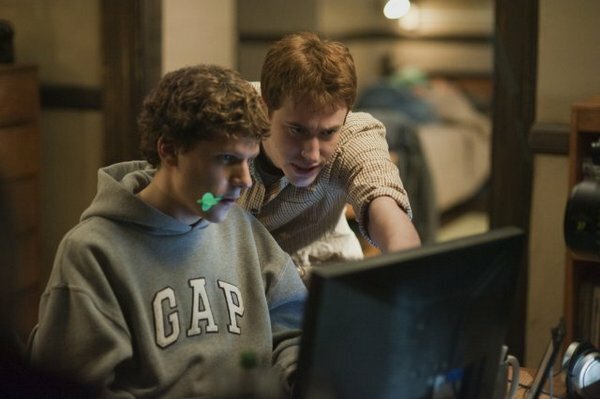 Despite a few moments where truth seems to win out over storytelling, The Social Network tells a genuinely engaging story and does so with some empathy for a diversity of characters. It does this with some rather dry historical material, and it does develop a very human story, although it is a little on the superficial side. From the opening scene, which shows not only Zuckerberg’s dumping by girlfriend Erica Albright but also the reason for it, this film is distinctively about Mark Zuckerberg. He would be an awfully boring subject, though, without the rest of this impeccable cast. The standout is certainly Andrew Garfield‘s performance as Zuckerberg’s foil Eduardo Saverin, which almost singe-handedly salvages the damage done by the awkwardness of Jesse Eisenberg‘s Zuckerberg. Eisenberg’s depiction of Mark Zuckerberg is discomforting. Of course, it is not an easy thing to depict a living celebrity, and this particular celebrity, as the king of geekdom, must be a particular challenge, but I was left wondering what kind of human being I was seeing. At times, he seemed to be dealing with a condition on the autism spectrum, rather than merely being socially awkward, and yet even this was not consistent. At times he would suddenly animate, then return to a morose obsessive. Perhaps this impression was what was intended. For all I know, this could be exactly what Mark Zuckerberg is like, but whatever the reason, it was disconcerting. The major strength of this film is that although it’s a story about the development of Facebook intertwined with the story of a lawsuit, both of which threaten dullness, the human element is palpable and immediate. In fact (and I can’t believe I’m saying this about an American film), I think the story could have benefited from a little more pathos around its central characters. There is a very human story here, and it barely emerges from the more technical process of depicting historical events. I suspect that this film will date quickly. I would guess that, unless some major legal battle puts an end to Facebook, this story will be told again and again, and the best expressions of it are still to come. Hopefully some of them will be written with more concern for the characters, and will be performed with greater clarity.